As the saying goes, good tattoos ain’t cheap, and cheap tattoos ain’t good. More often than not, we are requested to remove poorly executed tattoos that were purchased at a low cost, with poor final results. Removing tattoos is a long process that should only be performed by trained professionals. The safest environment for tattoo removal is in a medical clinic, or by a tattoo shop with extensive experience in removals. When comparing the two machines, let’s examine one of the clinical study photos where the PicoSure laser was compared head-to-head with the best Q-Switched machine available on the market. 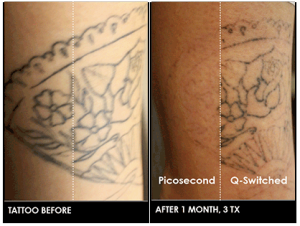 Both sides of the same tattoo were treated; one treated with the PicoSure laser, and the other with the Q-Switched machine. The results speak for themselves. There is a high demand for Kitchener laser tattoo removal, with minimal clinics offering it. We encourage our clients to arm themselves with research and explore other clinics and their technology. At Onyx, we are the only Kitchener and Waterloo laser tattoo removal clinic offering our treatments with the PicoSure laser. To learn more about Kitchener Laser Tattoo Removal, please submit our Cosmetic Medicine Contact Form, and we will get back to you as soon as possible. For regular updates on tattoo removal and other cosmetic procedures, Like us on Facebook and Follow us on Twitter. Please note: All Kitchener laser tattoo removal consultations require a $50 booking deposit that will be put towards your removal treatments. Request a comprehensive cosmetic assessment with Dr. Kam or one of our head nurses to discuss your needs and desires for a customized PicoSure laser tattoo removal treatment plan. Appropriate options for your timeline, budget, and skin type will be presented according to your removal goals. The $50 fee will be applied to your treatment within 1 month of the initial consultation.